HUNTSVILLE — Police are pursuing the operator of boatload of people who allegedly swamped a group of kayakers, knocking them over in their watercraft. Provincial police say that on Monday, Aug. 6, the Huntsville detachment received the marine complaint. 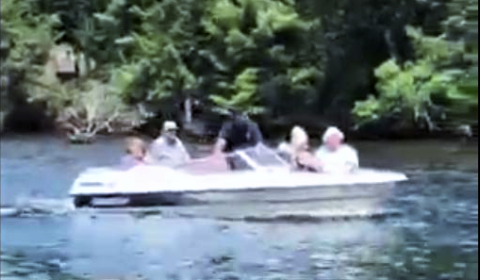 They say a concerned citizen reported to police that on Sunday August 5, 2018, at about 1:30 p.m. she and her family were kayaking in the lake of Bays area on Oxtongue River, when she says a blue Sunray bow rider with five people passed them at such a high rate of speed that it caused a wake flipping the kayaks. Police would now would like to speak to the owner of the boat and is asking that anyone with any information to contact the detachment. The kayaker managed to get a photo of the boat as they were leaving the area. The OPP says that the waterways patrolled by them have seen their fair share of tragedies this summer, and Huntsville OPP would like to remind everyone to boat safe.